For centuries the site of Cochrane was used by indigenous peoples as a summer camping ground. Later it became a stopping place for fur traders en route to Moose Factory. In 1907 the Temiskaming and Northern Ontario Railway (later Ontario Northland) chose 'Little Lakes Camping Ground' to be its junction point with the National Transcontinental (later Canadian National). 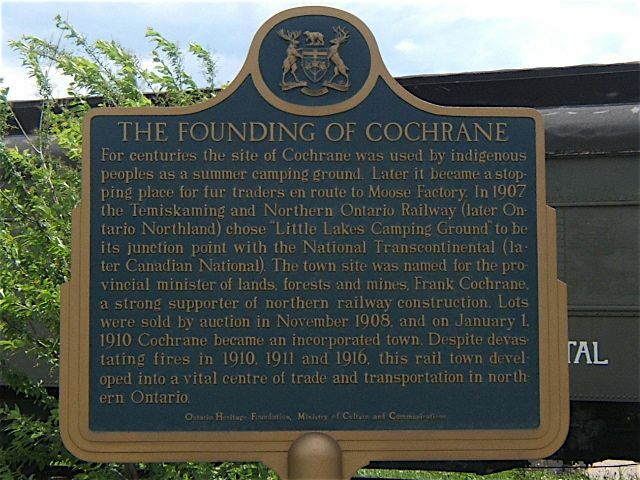 The town site was named for the provincial minister of lands, forests and mines, Frank Cochrane, a strong supporter of northern railway construction. 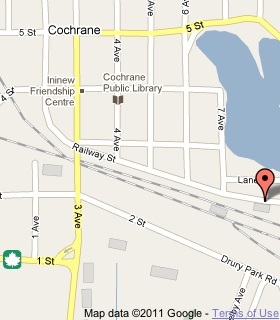 Lots were sold by auction in November 1908, and on January 1, 1910 Cochrane became an incorporated town. Despite devastating fires in 1910, 1911 and 1916, this rail town developed into a vital centre of trade and transportation in northern Ontario.